Collegedale, TN is located just east of Chattanooga and is part of the Tennessee River Valley. There is plenty of outdoor activities available including boating, canoeing, rafting, fishing, hiking and camping. Lake Ocoee, Okay River, and the Cherokee National Forest are nearby with even more opportunities for some outdoor adventures. Harrison Bay State Park is within a few miles with plenty of fun choices such as biking, basketball and tennis courts, softball and volleyball fields, and boating, fishing, and swimming. With all the beautiful natural sites to see while hunting, hiking or camping, it’s no wonder so many people love the area. Most of us here in the Collegedale and Tennessee Valley area love to be outdoors. But equally important to us is the indoor security and comfort of our homes. If you are a homeowner in the Collegedale area, you probably agree that it is a blessing to live in the area if you love the outdoors. With the holidays and winter season right around the corner, it will soon be time to put away the swimming and boating gear and perhaps get the firewood stash organized and ready. On your way out to the seasoned wood pile, take a look at the exterior of your home. How long has it been since it was painted? Even though we live in a relatively moderate climate, the weather and time still do its work to scour away the surfaces of our homes. Is the paint starting to fade, or do you already have some starting to peel away? It’s probably time to consider repainting the exterior or resealing the decking or fencing. If it has been some time since your home has been painted, you will want to consider having it done. When paint wears off a home, the surfaces can be exposed including any cracks or crevices the old paint had once covered. This allows bugs and pests and possibly mold or mildew into the home. 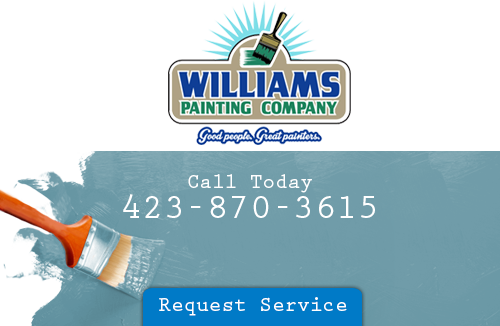 Williams Painting Company is a local experienced painting company with over 20 years of experience. We provide superior painting services to Collegedale and surrounding areas. We have painted homes, churches, commercial kitchens, and apartments. Our goal is to provide you with clean, quick, efficient, and perfect results in every painting project we do. What we love best about what we do is when we see your eyes light up as you take the first look at your newly painted space. We want you to be happy and comfortable in your home, which is why we work so hard to please you. Your home can have a fresh, new exterior with a new coat of paint. Your home can stand out from the rest in the neighborhood, just by providing it with some fresh color. If you are looking for a professional painting contractor in Collegedale, Tennessee, call Williams Painting Company LLC at 423-870-3615 or complete our online request form.